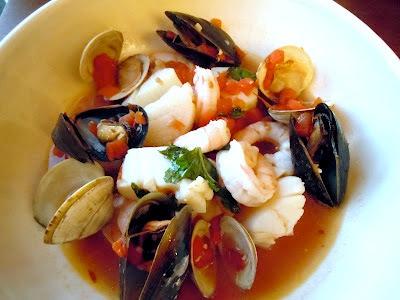 This Cioppino recipe is one of our favorites. We can't wait for the weather to get a little cooler every year so we have an excuse to make it. The only problem is that we like all the usual ingredients in it. The clams, the lobster, the mussels. Sometimes it's hard to find a few of the essentials, though. Or else we can find them, but the prices are so jacked up that we can't justify spending so much. But we want them all! Luckily, we wanted this one Friday for Lent and we were able to find all of the seafood at reasonable prices. The mixture of all the different textures is fun and really delicious. The broth is a little spicy, but it's perfect for dipping the warm, crusty bread in. Hope you enjoy this before the weather heats up again! Heat oil in a heave large pot over medium heat. Add the garlic, bay leaf and red pepper. Saute until the garlic is tender, about 1 minute. Add the wine and bring to a boil. Add the tomatoes and bring to a simmer. Simmer until the tomatoes begin to break down and the flavors blend, about 5 minutes. Stir in the clams. Cover and cook for 5 minutes. Stir in the mussels. Cover and cook until the clams and mussels, about 5 minutes longer. Using tongs, transfer the opened shellfish to serving bowls (discard any shellfish that do not open). Add the scallops and lobster to the simmering tomato broth and cook for 3 minutes. Add the shrimp and basil. Simmer until the shrimp are just cooked through, about 1 1/2 minutes longer. 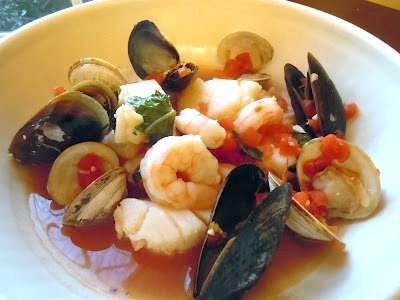 Divide the seafood and tomato broth among bowls. Serve with warm bread. I love stuffed mushrooms. 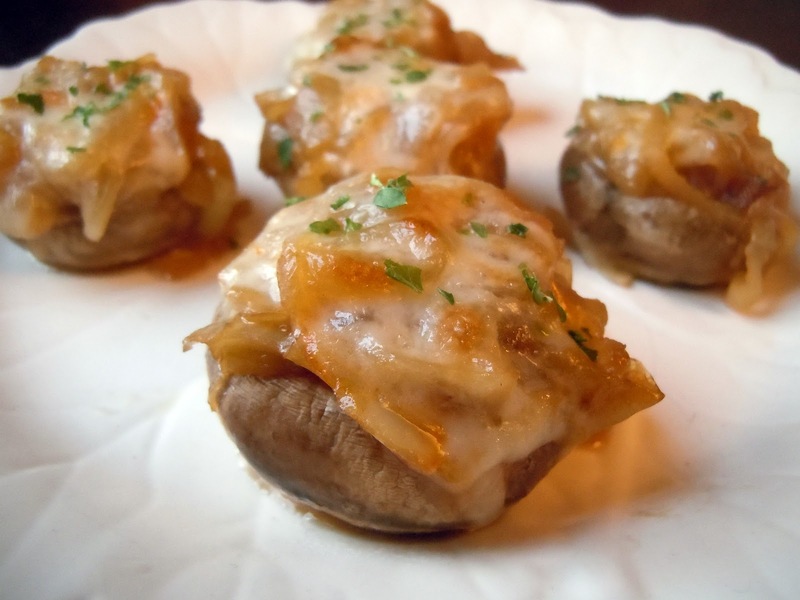 I love mushrooms in general, but they're even better when they're piled high with a delicious filling﻿. I usually just have mushrooms that are stuffed with some kind of breadcrumb mixture. It's easy, simple, and gets me the results I want. But these? The stuffed mushrooms are on a whole other level. French Onion Soup is easily one of my favorite soups, so it's no surprise that taking those same ingredients and packing them into a tiny mushroom would give great results. We had these as a side dish, but next time I'm definitely serving them as an appetizer. They're easy enough to make and I'm sure they'd be a real crowd pleaser. Enjoy! In a medium skillet, melt 1 tablespoon butter over medium heat. Add onions and saute for 15 to 20 minutes, stirring occasionally, until very soft. Splash in wine, broth, and Worcestershire. Cook for another 5 minutes, or until liquid is cooked down. Set aside. Melt 1 tablespoon butter in a large skillet over medium heat. Throw in mushrooms and toss around for 2 minutes, just to start the cooking process. Sprinkle mushrooms with salt. Place mushroom caps face down in a baking dish. 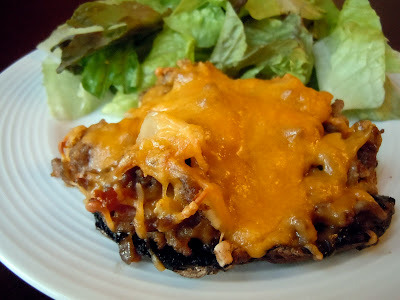 Heap cavity with sauteed mushrooms, then sprinkle Muenster over the top. Bake at 10 minutes on 325 degrees. Turn on broiler and broil for a couple of minutes, until the top of the Muenster starts to bubble and slightly turn brown. Remove from oven and place on a paper towel to blot the excess liquid. Sprinkle minced parsley over the top and serve. The other weekend, one of my girl friends was coming over for dinner, wine and movie night. Since it was a Friday during the Lenten season, we decided to have a simple soup and salad dinner. I picked up some Lobster Bisque and Broccoli Cheddar soup, but I needed something quick to throw together for the "salad" part. Since I want to have something homemade, I knew it had to be something quick, but still a show stopper. This has got to be one of my favorite salads. I'm a new lover of avocado, and caprese salads have always been a staple for me. The flavor was so fresh and simple. We both really enjoyed this and I will definitely be making it again soon. Enjoy! In a large bowl, combine the tomatoes, mozzarella, basil and parsley, Set aside. In a small bowl, whisk the lemon juice, oil, salt and pepper. Pour over tomato mixture. Toss to coat. Cover and refrigerate for 1 hour before serving. Just before serving the salad, stir in the chopped avocados. Serve salad with slotted spoon and toasty bread. Hi all. It’s Amy’s mom again. Since I am half Italian and half Czechoslavakian (Austrian Hungarian, Polish or whatever was the "good" country at the time according to my mom), I love to make both Italian and Slavic recipes. Besides pastas, sauces, pizzas and meats, we also had halushki (cabbage & noodles), halupki (stuffed cabbage), kielbasa, nut roll, poppyseed roll, and pierogies. We all had a very diverse palate. 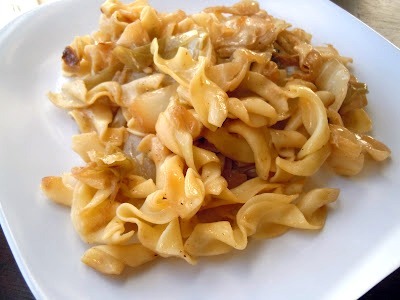 This recipe for halushki is so easy because there are no real measurements- it’s all according to taste and eye. If you like more cabbage, get a bigger head. If you like more onions, add another. The secret is LOTS of fresh ground black pepper. Enjoy! Note from Amy: The pictures don't have any pepper on them, but like my mom said...add lots!! Heat oil in a large pan. Add cabbage & onions. Keep turning until caramelized. That’s the trick. If they’re not caramelized enough, it doesn’t taste the same. Add more oil if necessary so that it’s not too dry. Add pepper as you go along. In the meantime boil water and cook noodles. 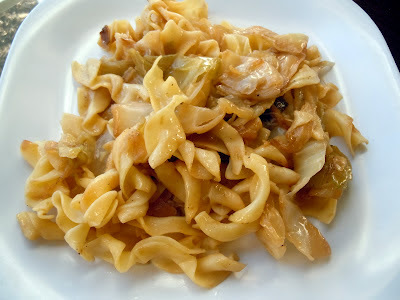 When cabbage mixture is ready, add noodles (or vice versa, whichever pan is larger). Add more pepper and serve. Some of my kids add Parmesan cheese- the best of both worlds. *Don’t tell anybody but it’s good even cold right out of the fridge! Yummy!!!! Once again, Asian flavors came into play during dinner. I think sesame oil is one of the best Asian flavors out there. I use it in the Sesame Noodles I make, and those are undoubtedly one of our favorite meals. So the use of that in these meatballs in addition to scallions, soy sauce and fresh cilantro makes them have amazing flavor. I love that they're made with turkey and that they're mixed with so many intense flavors that all really stand out. The dipping sauce has a great tang from the lime and also makes them really fun and different. I actually doubled the sauce recipe and tossed half of it with some steamed green beans. It made a great side dish! You can also make these a little smaller and serve them as an appetizer with toothpicks. Enjoy! Serve meatballs with remaining sauce, about 1 tbsp. per person. 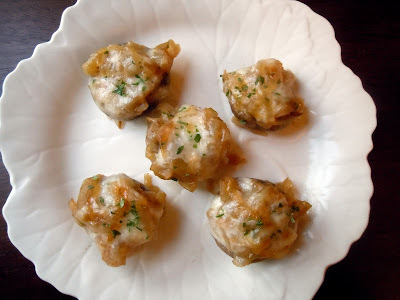 Today is my next post for the Secret Recipe Club. I was assigned Gloria's blog over at The Ginger Snap Girl. I absolutely fell in love with her blog and spent almost an hour sorting through all of her recipes. Although I chose this recipe for reveal day, I had an incredibly hard time narrowing it down! All of her recipes look delicious and her pictures make everything so tempting! Since I'm on a diet it was easier for me to pick this one out, but I was SO close to making the apple pie muffins or the New York style crumb cake. I'll get to them one day, though. That's for sure! These mushrooms were extremely tasty and definitely reminded me of a loaded cheeseburger. I adjusted the measurements a little since I wanted to use portobello mushrooms and serve this as an entree, so I used a full pound of meat and just tripled the rest of the ingredients. Same concept, just on a bigger scale. Gloria noted in her post that her family serves similar mushrooms using bacon instead of ground beef, so I decided to add a couple slices of bacon in there just to spruce it up a bit :) It added a ton of great flavor to the filling! These were perfect for an entree, but they'd also be great if you use smaller mushrooms and serve them as a side dish or appetizer. Enjoy! Clean mushrooms with a damp paper towel. Line a baking sheet with foil and spray with non-stick cooking spray. Place mushrooms topside down on foil lined baking sheet and cook for 5 minutes. Remove from oven and set aside. Brown ground beef in a non-stick skillet. Season beef with seasoning salt halfway through the cooking process. Once beef is cooked, drain off the fat and place ground beef in a medium bowl to cool. Once beef is room temperature, stir in onions, bacon bits, 2 tbsp. cheese and mayonnaise. Generously fill each mushroom with the beef mixture. 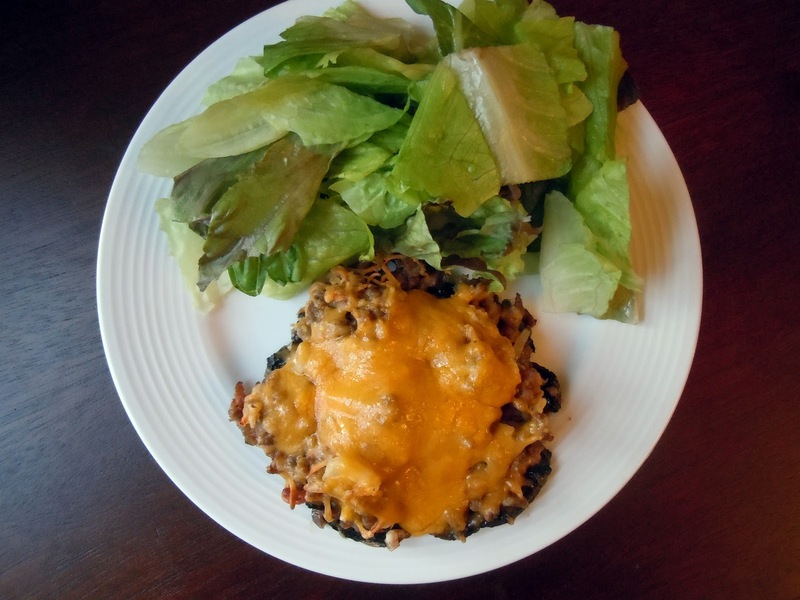 Sprinkle filled mushrooms with grated cheese. Bake for 20 minutes or until the cheese is melted and lightly browned. What better way to celebrate St. Patrick's Day than with something green? Here's something sweet to wash down with all that green beer you'll be drinking tomorrow. Grasshopper cake is made with crème de menthe, which is just a mint flavored liquor. This cheesecake version is a little different than the traditional cake version, but anything that includes cheesecake is a winner in my book. The cake is really light and creamy with a subtle minty flavor. There's not even a crust that you have to make beforehand, so that makes this quick and even healthier in my opinion. Enjoy and Happy St. Patrick's Day! In 1-quart saucepan, heat topping ingredients over medium heat, stirring constantly, until smooth; remove from heat. Carefully spread over cheesecake. Refrigerate at least 3 hours until chilled. Store covered in refrigerator. Sure the name is a little strange. Oranges? Sour cream? Chocolate chips? Together?! Believe it! These muffins are a nice little switch from your normal breakfast routine of oatmeal, cereal or pop tarts. The orange flavor in these muffins is very subtle, but definitely noticeable. I've found that the sour cream addition makes these kinds of snacks very moist and fluffy. I knew as soon as I saw it in the title that these would be decadent little breakfast treats. And the chocolate? Well, who can go wrong with chocolate? It's a nice little boost in the morning and pairs nicely with the orange. Enjoy! Heat the oven to 375 degrees F and line a 12 cup muffin pan with paper liners. I usually always buy Chris one big gift for holidays such as his birthday and Christmas and then a bunch of smaller gifts. Sometimes they're serious and sometimes they're gag gifts. My parents gave us a beautiful crystal decanter that has just been sitting on our bar, so one thing I decided to get Chris this past Christmas was a bottle of Johnny Walker Black to fill it up. Some people might think this is cool, but to us it was definitely more of a gag gift. Chris had always joked that when he bought a house, he would come home from work, put on his sweatpants, pour a glass of whiskey/scotch and relax. If you could only see his facial expression when he takes a sip of whiskey...well, you'd know why this is funny. He's had some friends over since Christmas and the bottle is surprisingly dwindling down, but I still wanted to put it to use before it was all gone. When I made this steak, I decided to substitute the cognac or brandy for some of this whiskey. It tasted really good! Since I'm not a steak person, if we have it for dinner it needs to have a really yummy sauce to accompany it. And this one fit the bill. I just did a light drizzle on top, and the flavor really took over. The shallots and scallions gave the sauce a little kick and the lemon added some zing. I also decided to add some beef broth to loosen it up. Enjoy! Melt 2 tbsp. butter in a heavy skillet; add steaks and cook approximately 4 minutes on each side for medium-rare; about 2 minutes longer per side for medium. Remove steaks to serving plate and keep warm. Add into pan drippings, mustard and shallots. Sauté over medium heat 1 minute. Then add 2 tbsp. butter, lemon juice, Worcestershire sauce and chives. Cook for 2 minutes. Add brandy and beef broth; pour sauce over steaks. Sprinkle remaining scallions over the top.